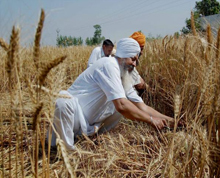 One of the wealthiest states in the country, Punjab is known for high productivity of wheat crop, hardworking Sikhs and religious harmony among people of different faiths. 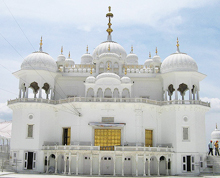 Punjab is the only state in India that has Sikhism, the warrior sect founded by Guru Nanak, as majority faith and its followers Sikhs are known for their martial prowess. Having a distinct identity in dress code, practising religion and social upbringing, Sikhs are reputed for their bravery and extreme acts of valour even in times of distress. The state is bordered by the Indian states of Jammu and Kashmir to the north, Himachal Pradesh to the east, Haryana to the south and southeast, Rajasthan to the southwest, and the Pakistani province of Punjab to the west. The state capital is located in Chandigarh, a Union territory and also the capital of the neighbouring state of Haryana. The summer residence of the Governor of Punjab is at Shimla.After the partition of India in 1947, the Punjab province of British India was divided between India and Pakistan. The Indian Punjab was further divided in 1966 with the formation of the new states of Haryana and Himachal Pradesh alongside the current state of Punjab. The term Punjab comprises two words: "punj" meaning five and "ab" meaning water, thus the land of five rivers. The Greeks referred to Punjab as Pentapotamia, an inland delta of five converging rivers. In Avesta, the sacred text of Zoroastrians, the Punjab region is associated with the ancient 'hapta həndu' or Sapta Sindhu, the land of seven rivers. Agriculture is the largest industry in Punjab. Other major industries include the manufacturing of scientific devices, agricultural tools, electrical goods, financial services, machine tools, textiles, sewing machines, sports goods, starch, tourism, fertilisers, bicycles, garments, and the processing of pine oil and sugar. Punjab also has the largest number of steel rolling mill plants in India, whichare located in "Steel Town" - Mandi Gobindgarh in the Fatehgarh Sahib district. In 1947 the Punjab province of British India was partitioned along religious lines into West Punjab and East Punjab. Huge numbers of people were displaced, and there was much communal violence. Following independence, several small Punjabi princely states, including Patiala, acceded to the Union of India and were united into the PEPSU. 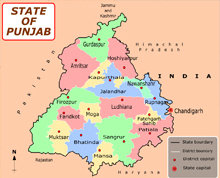 In 1956 this was integrated with the state of East Punjab to create a new, enlarged Indian state called "Punjab". Punjabi Muslims were uprooted similarly from their homes in East Punjab, which now forms part of India. More than seven million moved to Pakistan, and over six million settled in Indian Punjab. 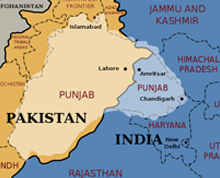 In 1950, two new states were recognised by the Indian constitution: the Indian part of the former British province of Punjab became the state of East Punjab. While the princely states of the region were combined into the Patiala and East Punjab States Union (PEPSU). Himachal Pradesh was later created as a union territory from several princely states in the hills. The capital city of the undivided Punjab province was Lahore during colonial times. But after Independence, Lahore was made capital of Pakistani West Punjab during the partition of British India in 1947. Hence, a new capital for Indian Punjab was built in Chandigarh. Shimla was named temporary capital of the Punjab until Chandigarh was completed in 1960. After years of protest by Akali Dal and other Sikh organisations Punjab was finally divided along linguistic basis in 1966. On 1 November 1966, the Hindi-speaking southern half of Punjab became a separate state called Haryana. And the Pahari speaking hilly areas in north east were formed into a new state called Himachal Pradesh. Chandigarh was on the border between the two states and became a separate union territory but serves as the capital of both Punjab and Haryana. During the 1970s, the Green Revolution brought increased economic prosperity for the Punjab, mainly due to the late Chief Minister Pratap Singh Kairon. However, a growing polarisation between the ruling Congress (that ruled both in the national capital New Delhi and Punjab) and the main Sikh political party the Shiromani Akali Dal gave rise to sectarian demands in 1970s. Hostility and bitterness arose from what was widely seen by the Akali Dal as increasing alienation, centralisation and discriminatory attitudes towards Punjab by the Union government. This prompted the Shiromani Akali Dal to pass the Anandpur Sahib Resolution, which asked for granting maximum autonomy to the region of Punjab and other states and limited role and powers of the Central Government. The Anandpur Sahib Resolution which gave rise to different interpretations was a unanimous document passed at a meeting of the Sikh political party the Shiromani Akali Dal in 1973. The document was largely forgotten for a sometime after its adoption, but came into the limelight in the 1980s. The Akali Dal and the religious leader Jarnail Singh Bhindranwale joined hands to launch the Dharam Yudh Morcha in 1982 in order to implement the Anandpur Sahib Resolution. Thousands of Sikhs joined the movement, feeling that it represented a real solution to demands such as a larger share of water for irrigation and the returnof Chandigarh to Punjab. Then Prime Minister Indira Gandhi viewed the Anandpur Resolution as a secessionist document. She used the declaration to portray the Akali Dal as a separatist outfit and urged the Sikhs to reject the Akali Dal. The Akali Dal officially stated that the Anandpur Sahib Resolution did not envisage an autonomous Sikh state of Khalistan. Its president Harchand Singh Longowal has clarified that the Sikhs have no designs to get away from India in any manner. They simply wanted to be allowed to live within India as Sikhs, free from all direct and indirect interference and tampering with their religious way of life. Punjabi Suba Movement led by the Akali Dal aimed at creation of a Punjabi-majority state (Suba) in the Punjab region of India in the 1950s. Concerned that creating a Punjabi-majority state would effectively mean creating a Sikh-majority state, the Indian government initially rejected the demand. After a series of protests, violent clampdowns on the Sikhs, and the Indo-Pak War of 1965, the government finally agreed to partition the state, creating a new Sikh-majority Punjab state and splitting the rest of the region to the new states of Himachal Pradesh and Haryana. Not content with an exclusive state, the Sikh leaders demanded more autonomy alleging that the Centre was discriminating against Punjab. While the Akali Dal explicitly opposed the demand for an independent Sikh country, the issues raised by it were used as a premise for the creation of a separate country by the proponents of Khalistan. In 1971, the Khalistan proponent Jagjit Singh Chauhan travelled to the US. He placed an advertisement in The New York Times proclaiming the formation of Khalistan and was able to collect millions of dollars from the Sikh diaspora. On 12 April 1980, Chauhan met then PM Indira Gandhi before declaring the formation of "National Council of Khalistan", at Anandpur Sahib. In May 1980, Jagjit Singh Chauhan travelled to London and announced the formation of Khalistan. A similar announcement was made by another leader Balbir Singh Sandhu at an event inAmritsar where postal stamps and the currency of Khalistan were released. The total inaction of the Indian government in Amritsar and elsewhere was flayed by Akali Dal headed by the Harchand Singh Longowal as a political stunt by Congress party led by Indira Gandhi. 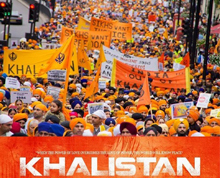 The Khalistan movement reached its peak in the 1970s and 1980s with groups of activists and splinter units mounting attacks on Indian establishments. A series of terror attacks in Punjab was perpetrated by the Khalistan outfits that were liberally support with arms and funds by Pakistan. Pro-Khalistan outfits were involved in a separatist movement against the Indian government ever since. There are claims of funding from Sikhs outside India to attract young people into these Khalistan militant groups. An infamous Indian Army operation from 3 to 8 June 1984 ordered by PM Indira Gandhi to flush out Khalistani militants holed up in Harmandir Sahib complex in Amritsar has been a watershed event in Punjab history. Khalistani activists led by Bhindranwale had taken residence in the Golden Temple complex, the holiest shrine of Sikhs, and began to preach secessionist language to innocent devotees. The Army operation had two components — Operation Metal confined to the Harmandir Sahib complex and Operation Shop which raided the Punjabi countryside to capture the fleeing activists and suspects. Following Operation Blue Star, Operation Woodrose was launched in the Punjab countryside where Sikhs, specifically those carrying a ‘kirpan’ and protesting against Indian state were rounded up. Blue Star was carried out by the Army troops with tanks, artillery, helicopters, and armoured vehicles and tear gas. Casualty figures of Operation Blue Star given by General Kuldip Singh Brar put the number of deaths among the Indian army at 83 and injuries at 220. According to the official estimate, 492 civilians were killed in Operation Blue Star. 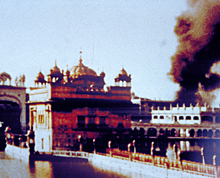 The military action led to an uproar among Sikhs worldwide. In fact, Operation Blue Star further invigorated the Khalistan movement in Indian and abroad. Most Sikhs at that time felt that India was not the right place to live in and the only solution was that of a separate nation for their religion Sikhism and its millions of followers. Many Sikh soldiers in the Indian army mutinied, Sikh officials resigned from armed and civil administrative offices. Eminent Sikhs returned awards and honour bestowed on them by the Union government to express anger against Operation Blue Star. Four months after the operation, on 31 October 1984 Indira Gandhi was assassinated by Satwant Singh and Beant Singh who were her two Sikh bodyguards. They pumped bullets into Gandhi's body to revenge her decision of ordering Indian Army to enter the Sikh's holiest place Harmandir Sahib complex. For the Sikhs, Operation Blue Star is entrenched as an indelible psychic scar in their subconscious mind. Even today, many Sikhs express their misgivings and vent their pent-up ire against the then Central government (notably Indira Gandhi) for ordering Army to invade the Golden Temple complex. In short, anti-Sikh riots are a series of pogroms (31 October - 3 November, 1994) directed against Sikhs by mobs instigated by the Congress leadership in response to the assassination of then PM Indira Gandhi by her Sikh bodyguards. There were about 3,000 deaths all over India including 2200 in Delhi alone. The CBI, the main investigating agency, is of the opinion that the acts of violence were organised with the support from the then Delhi police and some central government officials. Indira Gandhi's elder son Rajiv Gandhi was sworn in as Prime Minister after his mother's death. When asked about the anti-Sikh riots, he quipped, "when a big tree falls, the earth underneath shakes." Punjab witnessed a decade and half of militancy from 1981 till 1994, in whichthousands youth were either killed or gone missing. But after the death of militancy, the state has been peaceful but Punjabis say it has failed to reap the gains of peace. Those who witnessed the tumult of the 1980s describe the years after militancy ended in 1993 as years of abysmal governance. According to them, the years from 1993 saw the deterioration in education facilities, few new jobs, and a large proportion of youth getting addicted to drugs. In recent years, agriculture has stagnated, basic public services have been replaced allegedly by companies run by the ruling CM Prakash Singh Badal family and their associates. Punjab has become a hot-bed for corruption with the youth quitting the state due to unemployment crisis. The public finances are in a bad shape even as the government is doing very little to improve and expand the infrastructure facilities. The ruling Shironmani Akali Dal and the Badal family are accused of monopolising the state's finances. Political parties allege that in the cover of raising revenues for the state, the Badal government has started auctioning prime land on which public hospitals, courts, government's circuit house stand at present to private builders. According to one estimate, Punjab's debt has gone up from Rs 61,000 crore in 2008 to Rs 1.2 lakh crore in 2015, one of the highest among all states. The Punjab districts bordering Pakistan is grappling with drug addiction among youths as cartels are active in smuggling contraband from the neighbouring country. Most of the Sikh households are worst affected by drug trade as Punjab is being used as a transit hub to pass on the contraband to south-east Asian nations. For years, the Badal government has blamed a rising drug addiction among Punjab's youth on international drug cartels active along an axis running from Afghanistan and Pakistan to opium-growing areas in Rajasthan and Madhya Pradesh. But Jagdish Singh Bhola, a former DSP-turned-drug lord, was arrested in 2014 and he spilled the beans. In a major embarrassment for the government, Bhola named revenue minister Bikram Singh Majithia as the kingpin. Majithia is the brother-in-law of deputy CM Sukhbir Badal and brother of union minister Harsimrat Kaur. Once known for chivalry and heroic pursuits, most of the youths of Punjab are either into drug addiction or gripped by depression (or anxiety) with very little chance of rehabilitation. In fact, Punjab youths are caught in a real dilemma. While they don't want to follow the footsteps of their parents in farming or agro-business, there is very little job opportunities in the corporate sector for the educated youth. Once their much-hyped dreams are shattered, the youths in Punjab get into depression and take to liquor and drug addiction. However, the Badal government has not acknowledged the menace of drug addiction among the youths and is glibly content to stay put in denial mode. Slowly, but surely Punjab will be left with very little youthful energy to power its economy as teenagers and adolescents take to suicidal path of drug addiction.